We work directly with researchers to obtain information what they are doing, how they are doing it and the current status of their efforts. We then present their project in easy to understand terms to help you learn about various approaches to combatting the disease. Research Snapshots, available on the website, can be used as fact sheets at educational venues. Snapshots are put into one of five categories, which are color-coded and interlinked to make use easier. New snapshots are being added each month. 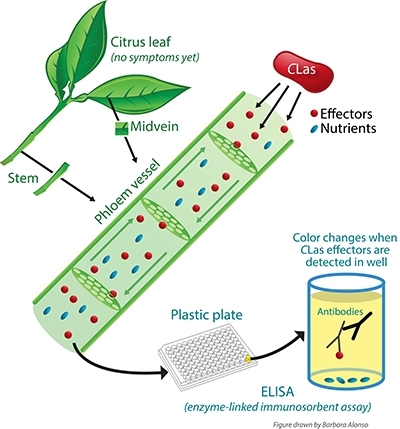 Dr. Wenbo Ma, a Professor of Plant Pathology at UC Riverside, is utilizing an antibody test to detect proteins or ‘effectors' that are released by the CLas bacterium into the fluid transport system (phloem) of the tree. 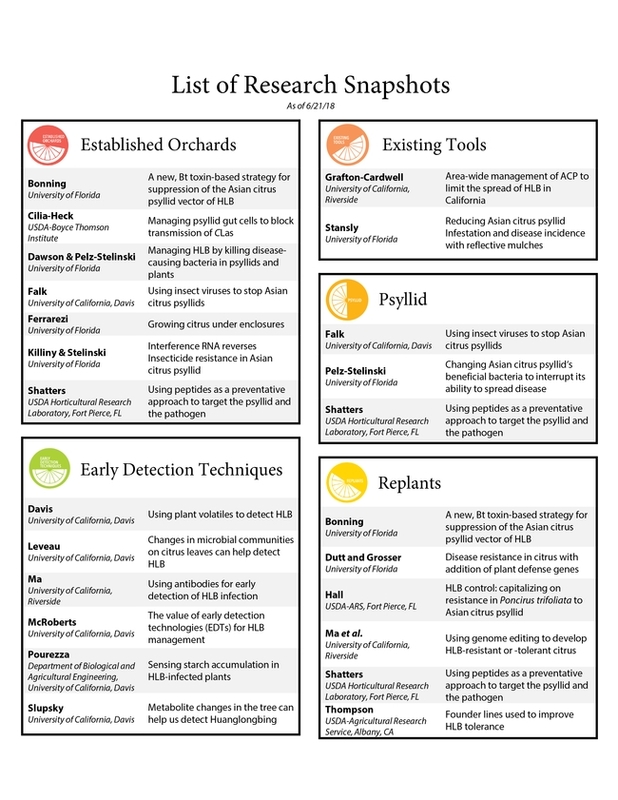 Detection of these ‘effectors' could be used as an early indicator of huanglongbing in citrus, long before symptoms show up in the tree and early enough in the infection process to help slow the spread of the disease by removing infected trees. 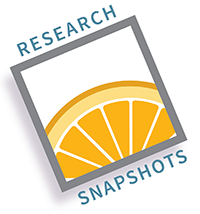 Download the Research Snapshot to learn more, and visit our Research Snapshots page. 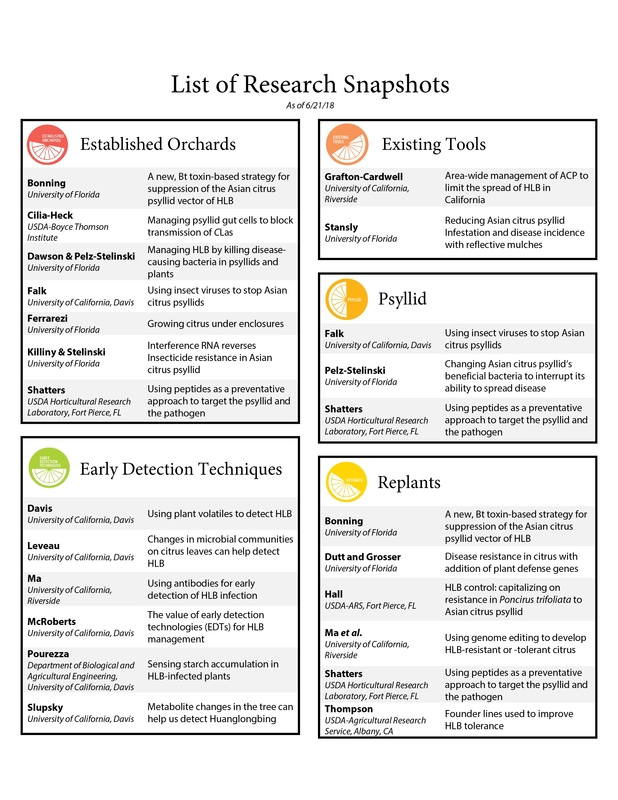 We have developed short, descriptions of research projects that aim to help in the fight against HLB. These projects include traditional breeding and genetic engineering to create resistant citrus varieties, psyllid modification, using other organisms to deliver HLB-resistance genes, and early detection of the bacterium in trees. How does a better trap improve Huanglongbing management?